Immediately upon our arrival at our new home in the UK, the Group settled down to prepare for the job we so eagerly awaited. To find ourselves the fortunate occupants of such a well equipped and planned base was beyond our fondest dreams, and our morale hit a new high. A group meeting was called for all personnel at which time our CO, Lt. Col. ISBELL, outlined our aims, - what was expected of the group and the individual. He also stressed the importance of the individual’s conduct while a guest of our British Allies. Capt. HINKLE, the Base Provost Marshall, gave us some helpful hints on how to avoid the inevitable pitfalls that befall the GI when he first encounters strange people, places and customs. 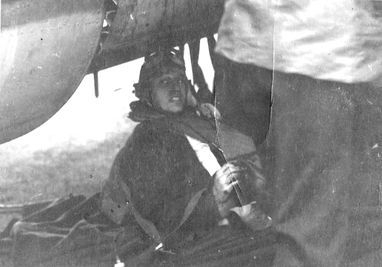 While the aircraft were being modified, intensive ground training was started. Classes for the combat crews were held daily on all navigational subjects. The ground crew were extremely busy getting the aircraft ready for combat duty. All other personnel were busy setting up their departments, working with the RAF detachment who were to be our guides as well as friends until we were able to take over. Daily lectures on security were given by the S-2 Section, and each member of the command was required to attend one of these lectures. Officers and enlisted men started attending schools on special subjects at London and various stations in the UK. These subjects included: Intelligence Training, P/W Escape and Evasion, Target Identification, Radio Code and Cyphers. One hundred and twelve combat crew members attended Combat Gunnery School at Station 172. Training for all combat crews is still in progress, emphasis being placed on Target Identification. Our first practice mission fell on 22 February, when the Group performed a camera bombing in the “WASH”. Actual battle conditions were simulated from briefing to interrogation. On 23 Feb, another practice mission in the “WASH”, but we sensed the tenseness and the eagerness of the combat crews as well as all other personnel, to get into the “Big League” as soon as possible. On 24 and 25 February, we participated in two diversionary missions to the coast of Holland and the occupied French Coast. The purpose of these mission[s] was to divert the enemy fighters from the main forces attacking targets in Germany. We were beginning to get “the scent”. “Diversionary missions [are] all well and good, but when are we going to get the real thing?” was the general question asked by all. At last on 2 March we were to taste the fruits of our training and labor. This day we completed our first sortie on FRANKFURT. This was Mission #5, but our first accredited sortie. In high spirits, nineteen of our aircraft led by Lt. Col. ISBELL [pictured at left], dropped 286x100 M47 bombs on BIRNBACK and STAUDT, GERMANY. Fighter opposition was weak with but four FW 190’s attacking our formation. The fighters were driven off, and upon interrogating the crews, it was noted with some pride the nonchalant manner the crews described the fighter attacks. One would think they were veterans of hundreds of missions rather than airmen meeting the vaunted LUFTWAFFE for the first time. Their high feelings boded no good for the German fighters who would challenge them on their next mission. It was interesting to note their reaction to FLAK. It was the consensus of opinion “We just don’t like the damn stuff.” All aircraft returned to the base with but five planes showing minor battle damage. From then on it seemed to be the accepted story “Alerted for Tonight”. We might say at this time we feel sure we hold the record for men who have attended a movie only to sit through half of it then be called away to load bombs. The less said about their remarks the better. Once again on 6 March we were out in force, this time to strike another Aero Engine Works in BERLIN. This was Mission 9 Sortie 4. Here was the eagerly awaited magic word “Berlin!! !” When the target was announced the excited comments left no doubt of the electrifying effect the mere mention of the word had on the crews. The twenty seven plane formation, led by Lt. Col. ISBELL as command pilot of the lead section followed by Major O’NEILL as command pilot of the High Section took off for “BIG B”. One thousand and ninety two M47 IB’s were dropped in Target area, GENSHAGEN, and two hundred and eight M47’s dropped on a target of opportunity POTTSDAM. Although the fighter opposition was weak, the formation encountered terrific accurate flak, causing battle damage to seven aircraft. We suffered the greatest single loss of aircraft and personnel, losing five aircraft with fifty [crew] members missing. (See diary for names etc) Their loss was due to combined E/A and Flak. Our effort this day gave us the distinction of being one of the groups who helped achieve the first large scale daylight attack against the German capital. Results were generally poor due to the unfavorable weather encountered. However, as some of the crew members stated, “at least we hit ‘Big B’ ”, and now that we know the way, we hope to be regular visitors. The next day, 9 March we accomplished Mission 11, Sortie 6. The ARRADO A/C works at BRANDENBURG was the target. However, due to 10/10th clouds over the target, the group led by Major O’NEILL dropped M47 clusters on a non visual target of opportunity. Bombing results were unobserved and no strike photos were available due to the cloud coverage. For a few days we enjoyed a well earned rest and it was not until the 15th of March that we were called upon again. This was Mission 12, Sortie 7. Twenty six of our aircraft led by Major HOGG and Major HENSON bombed the secondary target, the city of BRUNSWICK, GERMANY. Heavy undercast prevented visual bombing of the primary target. Our bombing was done through 10/10ths clouds by the aid of Pathfinder A/C, results were unobserved. Again on 18 March we visited FRIEDRICHSHAVEN, this time to strike at the DORNIER WORKS, and to complete Mission 15, Sortie 9. The formation started out led by Maj. O’NEILL and Capt. CHAMBERLAIN. This important target is responsible for the main production of DO 217’s. Nineteen of our A/C attacked with the following results: 70x500 GP on Primary Target, 364x100 GP on Secondary. Reported hits directly on buildings in the target area were observed. No strike photos on secondary target, but crews report hits in target area causing smoke and fire. No fighter attacks were made on our formation, but intense flak was encountered inflicting minor battle damage to fifteen of our aircraft. ST. OMER-WATTON, a Noball target was to receive a visit from us on our 16th Mission, Sortie 10 on 21 March. Fifteen of our aircraft led by Major HOGG and Maj. LA ROCHE, dropped 60x2000 Lb, GP on the Target. Cloud coverage prevented accurate estimate of damage. Eight of our aircraft returned with minor battle damage. On 26 March, Mission 21, Sortie 14, found BONNIERES A/F as our target for the day. Twenty seven aircraft were dispatched, but due to a navigational error in lead planes the target was not reached. Bombs were either brought back or jettisoned in the Channel. No E/A were sighted and flak [was] meager to intense and accurate. Seven A/C suffered minor battle damage. 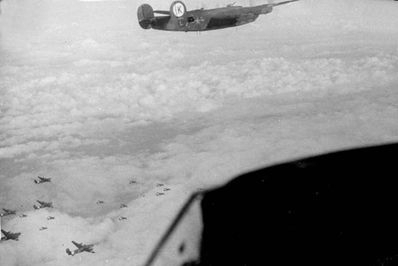 On 27 March, Mission 22, Sortie 15, a beautiful example of precision pin point bombing was observed when we hit BIARRITZ A/F in France. Twenty four aircraft, led by Major HOGG and Major HENSON dropped 1000x100 lb. M1 Frag Clusters on the airfield. Strike photos show bomb pattern along north and east side of field, includes bomb fuel dumps, dispersal areas, hangers, barracks, and aircraft in dispersal areas. No E/A were sighted and no battle damage from flak. As the crews remarked, “it was a darn long haul, but well worth it”. Weather set in after takeoff and continued poorly all day, necessitating our aircraft to land at another base in England. They returned to the base the next day and were then interrogated. Due to weather, this was to be our last mission for the month of March. As our second month ended in the ETO, we fell proud of the records we have accomplished. As a summary of operations from 1 March to 31st, we point with pride to our record of fifteen sorties on important military and industrial targets in GERMANY and German held territory. Twelve aircraft were lost, five [crew] members killed and one hundred and five missing. With the present high standard of morale we should go a long way to make this group the finest combat outfit in the ETO. By authority of VIII AF, General Order 215, dated 27 March 44, the Air Medal was conferred upon 29 Officers and 36 Enlisted Men. By authority of VIII AF, General Order 220, dated 28 March 44, the Air Medal was conferred upon 13 Officers and 23 Enlisted Men. By authority of VIII AF, General Order 233, dated 31 March 44, the Air Medal was conferred upon 36 Officers and 47 Enlisted Men. For exceptionally meritorious achievement, while participating in five separate bomber combat missions over enemy occupied Continental Europe. 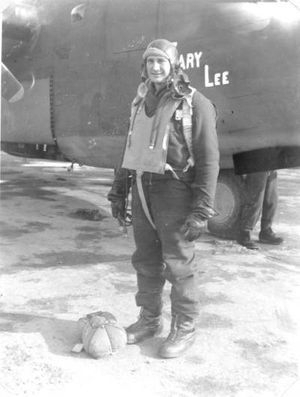 The courage, coolness and skill displayed by these Officers and Enlisted Men, upon these occasions reflect great credit upon themselves and the Armed Forces of the United States. The "diary" in the notation (See diary for names etc.) on many of the entries above was not included in the group's microfilmed records.